September 16, 2015 (Anaheim)--The California Republican Party announced that former Ambassador John Bolton would headline the CRP 2015 Fall Convention Saturday Dinner Banquet on September 19 at the Anaheim Marriott. Ambassador Bolton was chosen to replace Scott Walker at the Saturday Dinner Banquet when the Governor withdrew to focus his efforts on the early primary states. Ambassador Bolton served as the U.S. ambassador to the United Nations from 2005 to 2006, prior to which he served four years as the Under Secretary of State for Arms Control and International Security. Currently Ambassador Bolton is a foreign policy senior fellow at the American Enterprise Institute, an op-ed author to pieces featured in The New York Times, The Wall Street Journal and The Washington Times, and a contributor to FOX News Channel. Bolton has long been a vocal critic of both the United Nations and more recently, President Barack Obama, claiming his leadership has left the U.S. vulnerable. “From the Iran deal to China and Russia, we need to change the direction of America's foreign policy,” Ambassador Bolton said. “On Saturday, I’m looking forward to speaking at the CRP convention. It's important to continue the discussion on national security following the Republican debate at the Reagan Library." Bolton served as U.S. Ambassador to the United Nations under President George W. Bush and previously served in other Republican administrations. 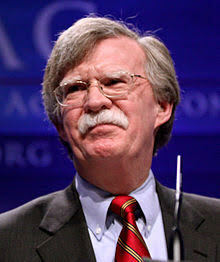 The Economist called Bolton "the most controversial ambassador ever sent by America to the United Nations." Accused by the State Department intelligence chief of abuse of power for pressuring intelligence analysts over their reports, Bolton resigned in 2006 when it became apparent he would not win Senate confirmation for his appointment which was made during a Congressional recess. then John Bolton speaking nonsense at a Republican convention, and Anaheim is a good place for it.